Deruta is identified as one of the top manufacturing centers of artistic majolica ceramics. The earliest record regarding this expression of art dates back to 12 August 1290, and testifies a payment “in kind” against “unam saumam vasorum”. That was the archaic period during which objects of common usage were manufactured: beakers, basins, bowls, “panate”, meagrely decorated, mainly with geometric and animal patterns. The prevailing colours are green “ramina” and manganese brown. During the subsequent centuries majolicas from Deruta reached the highest splendour and expanded in the Sixteenth Century in the major marketplaces of Europe. Artists such as Giacomo Mancini (“El Frate” – “The Friar”) and Francesco Urbini created works of prominence. Display plates, amatory chalices, straw-botiomed chalices, nobiliary armorial bearings show a range of patterns with female characters, mythological scenes, battles and Holy images. There are other several, different and original patterns, popular in that period: floral, zoomorphous. Grotesque, floral curls, peacock’s-feather’s eye, crown-of-thorns, wolf-tooth and petal-back like imbrications. In the meantime the range of colours became richer, and added orange, blue and yellow. The technique of metallic lustre, characterized by splendid golden reflections, began to appear in the most valued works. The first “lustre” piece, ascribed to Deruta, dates back to 1501 and it is a bas-relief representing the martyr of Saint Sebastiano, it is preserved in the Victoria and Albert Museum of London. Floors, such as the floor of the Church of St. Francesco in Deruta, of St. Maria Maggiore in Spello or of the Sacristy of St. Pietro in Perugia, are further evidence of the best Deruta majolica creations. In the course of times, the style and the decorative patterns have turned into the “epitomized” style, consisting of quick strokes, and the “calligrafico” (minutely-finished) style, of Moorish inspiration, consisting of twisting of flowers, leaves, arabesques, birds and other animals. 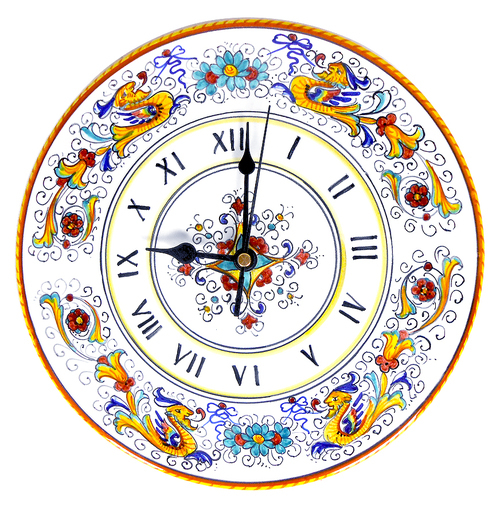 In the XVIII century there was a period of crisis during which Gregorio Caselli established a factory in Deruta to create majolica in imitation of porcelain. After the Unity of Italy a meaningful recovery was especially due to the activity of Angelo Micheletti, Alpinolo Magnini, Davide Zipirovic, whilst Ubaldo Grazia becomes well known for his “talent in copying”. In the present days the high level of artistic production is to be found by visiting the “living museum” stretching across the streets of Deruta, made of workshops, laboratories, factories, show rooms, where you can attend freely to the various steps of the production process. That is a reality to be found in the territory, as well, such as Ripabianca, known for the manufacturing of vases, oil jars, pitchers and pottery jugs. The maestro Luigi Boccini and his son Nicola Boccini are Italian artists that reproduce faithfully in ceramic the classical masterpieces from the 15th to 18th centuries. Luigi Boccini started the family business after a period of training in an old craft factory in Deruta, to exploit to his own natural talent for drawing and ceramics decoration, especially in the human figure. The Maestro Luigi Boccini likes to reproduce on ceramic subjects from “il Perugino” and “Botticelli” (from whom he has a wide collection of prints) on plates, vases, tiles, or panels from various size. The elegance of the stroke and the beauty of the colors he uses for these reproductions, are beautifully uncomparable. The variety of the themes, painted and decorated, and their own singularity make them collection pieces. Luigi Boccini works only with three colors typical from the old tradition of Deruta: blu, dark green and bright orange. From these colors he obtains all the gradations giving the impression that more colors are present in the composition. Nicola Boccini, the son, is professor of ceramics at the Deruta school and is both gifted with classical ceramics as well as experimental. Both won several award. Article and images (all but the top one) kindly provided by by Boccini ceramics.